Polished concrete densifier and polished concrete dye color materials. Lithium silicate concrete floor hardener and densifier. Sodium concrete densifier to harden concrete. Concrete densifier for dustproof concrete floors to harden the surface of concrete and increase durability. Polished concrete guard products for stain proof polished concrete floors. Aqualon L-100 is an environmentally friendly, VOC free, lithium silicate concrete floor densifier, hardener, and sealer. Aqualon L-100 is designed to penetrate untreated, bare concrete surfaces providing a permanent gloss, dust proof floor. Polished concrete lithium densifier. Aqualon L-100 reacts quickly with the concrete floor surface to produce an initial and ultimate hardness. 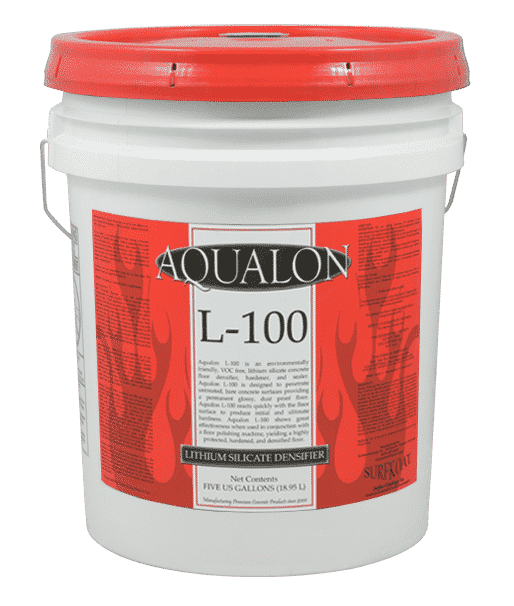 Aqualon L-100 lithium silicate concrete densifier shows great effectiveness when used in conjunction with floor polishing machines, yielding a highly protected, hardened, and densified polished concrete floor. 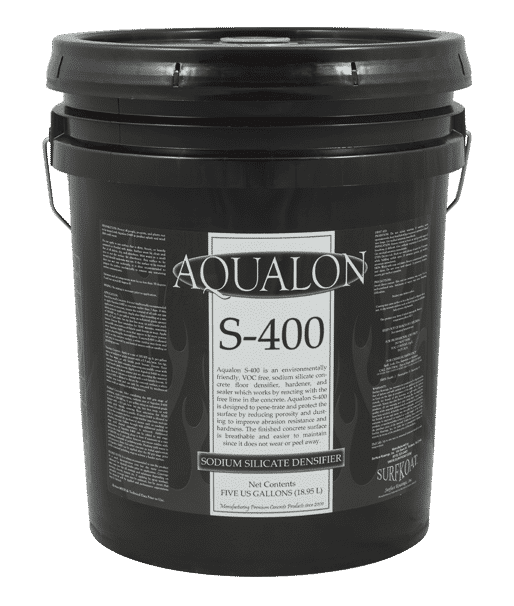 Aqualon S-400 is an environmentally friendly, VOC free, sodium silicate concrete floor densifier, hardener, and sealer which works by reacting with the free lime in the concrete. Aqualon S-400 is designed to penetrate and protect the surface by reducing porosity and dusting to improve abrasion resistance and hardness. The finished concrete surface is breathable and easier to maintain since it does not wear or peel away. Aqualon S-400 is also an excellent polished concrete densifier product. 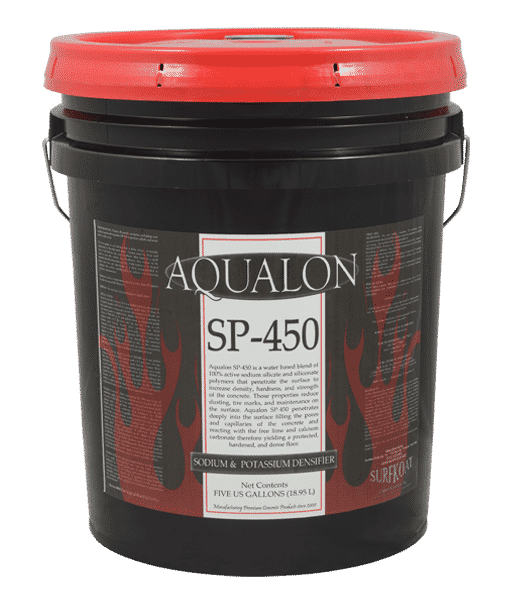 Aqualon SP-450 is a water based blend of 100% active sodium silicate and siliconate polymers that penetrate the concrete surface to increase density, hardness, and strength of the concrete. Those properties reduce dusting, tire marks, and maintenance on the surface. Aqualon SP-450 penetrates deeply into the surface of concrete filling the pores and capillaries of the concrete and reacting with the free lime and calcium carbonate leaving a protected, hardened, and densified concrete floor. TK-LS HARD is a premium, penetrating, lithium silicate hardener concrete densifier that reacts with the free lime in concrete to produce calcium silicate hydrate for the ultimate in surface density and strength. DK 900 invisibly protects chemically hardened industrial floors, commercial facilities, machine shops, auto repair facilities, and polished concrete floors from prolonged exposure to oil, salts and water damage. DK 900 is a dual component, water reducible, multifunctional, concrete protectant that repels oil, salt, de-icing agents, and water. 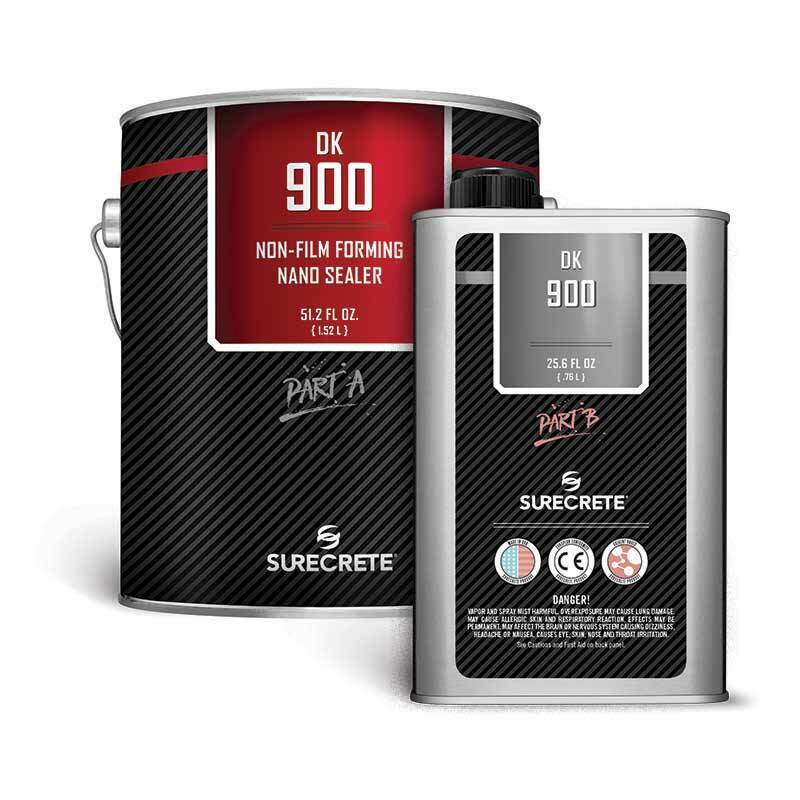 With its roots in Urethane and Acrylic nanotechnology, DK 900 is designed to be minimal/non-film forming on concrete, polished concrete, and natural stone surfaces. Nanotechnology allows for deep penetration into porous substrates DK 900 is excellent as a maintenance guard on existing slabs. Aqualon Nano Guard is a copolymer blend of high gloss sealer and high performance lithium silicate densifier. Aqualon Nano Guard is designed to give standard concrete surfaces beautiful sheen while providing improved resistance to stains and increased concrete surface hardness. A concrete surface that has been treated with Aqualon Nano Guard will substantially increase resistance to surface abrasion, water damage, and attacks from chemicals. 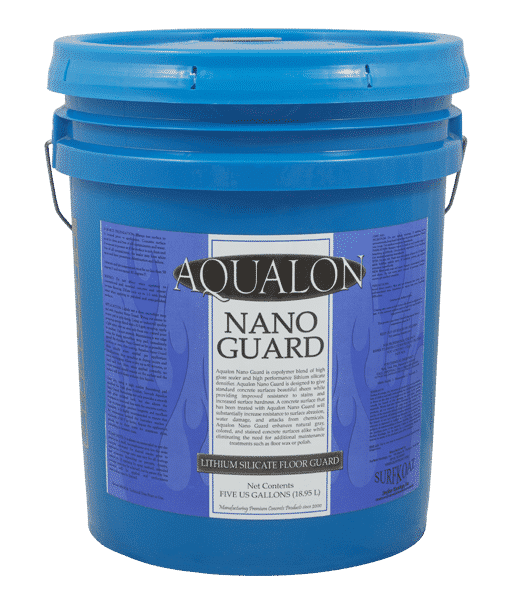 Aqualon Nano Guard enhances natural grey concrete, colored concrete, polished concrete, and stained concrete surfaces while eliminating the need for additional maintenance treatments such as floor wax or polish. A high performance, high-gloss hardener and protective surface treatment for concrete floors, polished concrete, and concrete surfaces. TK-LS HARD N GUARD makes use of lithium silicate nanotechnology to increase hardness, density and durability on new and existing concrete. Treated surfaces have higher resistance against water, chemicals and abrasion and require less maintenance and up-keep. Produces an attractive showroom-quality gloss over ground and polished concrete floors. Easy application; no scrubbing, flushing or waxing required. Aids in color retention making it ideal for integral colored concrete and stained floors. Short downtime; floor may be used approximately 1 hour after application. 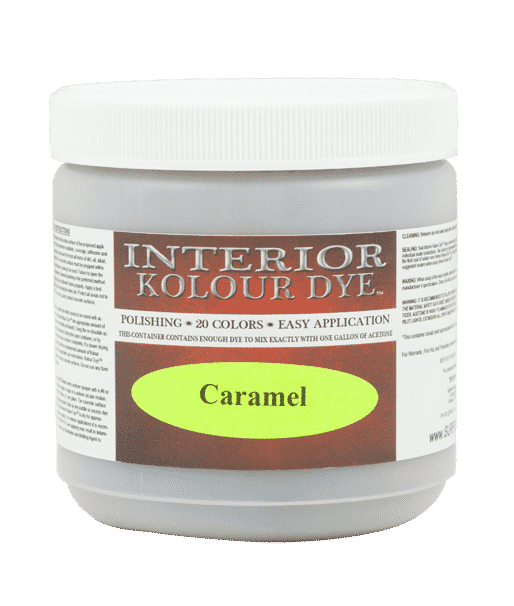 Kolour Dye is a translucent polished concrete dye, formulated using very find particles of color designed to penetrate and color interior concrete surfaces, including polished concrete. Kolour Dye creates a unique, multi-colored translucent color appearance. Kolour Dye polished concrete dye is available in twenty standard colors that can be combined to create an unlimited polished concrete color palate for marble effect. Suitable for interior use on concrete floors and surfaces in industrial, warehousing, manufacturing and food service environments. Its odorless formulation makes it ideal for enclosed, inhabited areas where solvent-containing systems may be hazardous to use. Offers increased strength for floors that are old, deteriorating or weak, or which are subjected to heavy traffic and abrasion. Will not chip, peel or flake off the surface. Odorless and contains zero VOCs (volatile organic compounds). Effective on new and old concrete surfaces and very easy to maintain. Combats surface ASR. A safer floor surface. Provides excellent non-slip, high traction properties. UV stable and resistant to abrasion and scuffing. Non-flammable and odorless formula for easy indoor use. Contains zero g/L VOC content. Contains high amounts of lithium which combats surface ASR. Provides superior sheen, and resistance to abrasion and scuffing. UV stable and breathable materials that will not peel, flake, discolor, or yellow. Non-flammable and low odor for safe indoor use. DK 900 is suitable for numerous interior or exterior surfaces including but not limited to polished concrete, broom finish concrete, stained concrete, decorative concrete, exposed concrete, honed and polished travertine, white Carrera marble, natural stone, pavers, synthetic stone, unglazed tile, and brick. It excels in performance on vertical and horizontal surfaces. DK 900 is a dual component, water reducible, multifunctional, concrete protectant that repels oil, salt, de-icing agents, and water. With its roots in Urethane and Acrylic nanotechnology, DK 900 is designed to be minimal/non-film forming on concrete and natural stone surfaces. Nanotechnology allows for deep penetration into porous substrates DK 900 is excellent as a maintenance guard on existing slabs. DK 900 is suitable for numerous interior or exterior surfaces including but not limited to polished concrete, broom finish concrete, stained concrete, decorative concrete, exposed concrete, honed and polished travertine, white Carrera marble, natural stone, pavers, synthetic stone, unglazed tile, and brick. It excels in performance on vertical and horizontal surfaces.